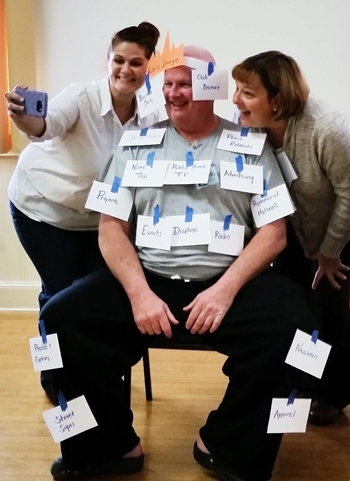 Let's hear it for good sport Lenny Cameron, who endured multiple indignities on Tuesday while helping district public image chair Amy Luckiewicz make a few points about getting the word out about our club. With President Connie as her assistant, Amy had poor Lenny covered in file cards before she was finished---but her points will definitely be remembered! Amy actually had high press for our club for all the things we do right. Nonetheless, we can always do better! 'Twas a great presentation!